This Single pack of Home Plugs puts a network point anywhere in the house where there is a mains socket. Each unit can both send and receive. Initially two of these units are needed. They are both identical. Plug one into a mains socket near the router. Connect a network lead from the router to the Homeplug. Plug a second unit into a mains socket in the room where you need the network point. Then a network lead to the computer or satellite receiver. The data is transferred through the mains wiring. No problems with wireless interference of wireless security problems. Additional single units can be added to other rooms - up to 200! 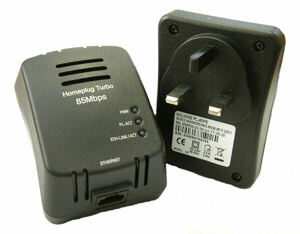 Ideal for Linux based receivers like CubeRevo, Technomate and Dreambox where the receiver may not be near a network point but is near a mains socket. 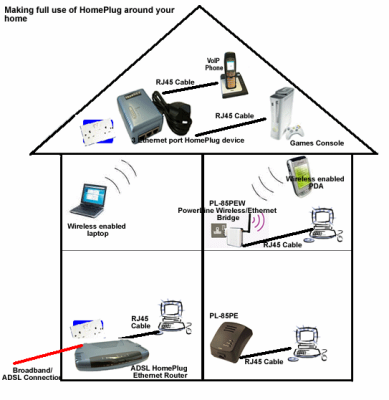 We tested Homeplug with a standard home network setup that incorporated a 4-port wireless router and there was nothing to do, the item worked straight out of the box. the mains wiring. No problems with wireless interference of wireless security problems.